Founding director of the Tyndall Centre for Climate Change: 'Time to ditch consensus' | Watts Up With That? Interview Just two years ago, Mike Hulme would have been about the last person you’d expect to hear criticising conventional climate change wisdom. Back then, he was the founding director of the Tyndall Centre for Climate Change Research, an organisation so revered by environmentalists that it could be mistaken for the academic wing of the green movement. Since leaving Tyndall – and as we found out in a telephone interview – he has come out of the climate change closet as an outspoken critic of such sacred cows as the UN’s IPCC, the “consensus”, the over-emphasis on scientific evidence in political debates about climate change, and to defend the rights of so-called “deniers” to contribute to those debates. As Professor of Climate Change at the University of East Anglia, Hulme remains one of the UK’s most distinguished and high-profile climate scientists. When we spoke to him on the phone, Hulme cited as evidence the 2007 protests against Heathrow’s third runway, where marchers made their case by waving a research paper at the TV cameras under a banner bearing the slogan “We are armed only with peer reviewed science”. May 6, 2009 in Climate_change, Politics. Sounds like a thoughtful, reasonable fellow who just caught a glimpse of himself in the mirror. If any of this nonsense about CO2 makes it into legislation in the form of taxes or cap and trade here in the US, I for one will volunteer my time to sit in jail for my refusal to pay any additional costs to what I buy as a result of this voodoo snake oil science. In other words, a tea party sounds like a good idea in the near future. The book is excellent, and should be read by both sceptics and warmists. Show us the falsifiable content. Anthony, thanks for posting this in its entirety. Very well written. Does he have any choice other than to ditch the consensus? I think he’s blowing the whistle too late! The steamroller has Prince Charles and his mates coming out of the closet now. It is a high climate profile year for the old chap and my thoughts go to succession. Climate skepticism is a broad church, all are welcome. Well done Mike for recognising the damage being done to science and society by the the AGW orthodoxy. No doubt he will become subject to personal abuse by alarmists for making his views public. It amazes me that there is such widespread consensus/fallacy that government sponsored or peer review science is the only analysis that maintains integrity. Today’s SF Chronicle tells yet another story the spotlights that fallacy. National Park Service scientists with held and misrepresented data trying to frame an oyster fisherman as environmentally harmful. Imagine that. Falsifying science and not being paid by big oil. Don’t use *science* to get around *politics* ??? They’ve still got it backwards. Pamela – the point Mike Hulme is making, and I do recommend his book, is that we loose a part of our humanity if we start throwing stuff around like ‘voodoo snake oil science’!! I hope it was in jest! Hulme’s book, which I have had for review, is true scholarship – but I could find no critique of the orthodox ‘science’ that underpins the politics and policy. Mike is foremost a social scientist rather than a hands-on climatologist, and so would not be in a position to analyse the science. Its not voodoo snake oil that we have to deal with – if it were, decent people such as he would have spotted it. The orthodox view is built upon computer models that create a virtual planetary ecosystem. Those models cannot handle cycles. All they can do is posit a natural variability – regarded as essentially random. It is an inherent limitation of the maths. In the whole of Mike Hulme’s book you will find no reference to cycles. The real problem we have is that Mike’s viewpoint – that the establishment should open discourse with its critics, is not shared by the climate modelling community. Thus, he makes no reference to the detailed scientific critique of the model that shows how cycles – particularly the oscillations in ocean basins, created the late 20th century peak, and have brought global cooling since. Nor does he reference the solar science that points to a possible new Little Ice Age by 2030. If we are not getting through to such an open person as Mike Hulme, then I have to say, I don’t know what course remains…..but we must not fall into the trap of slagging off the orthodox science created by a skilled and well-meaning community of climate modellers who simply cannot see their error, and who are protected from engagement in a wider debate by their managers eager to provide the simple answers that policy makers demand. Well, it seems that the story of gobal warming is coming to an end finally. However as it is said above “due to the fact that action on climate change is widely seen as a progressive goal…” a strong retaliation should be expected, because from a psychological point of view, to all those who their Berlin Wall unexpectedly fell down, won’t let this global warming or climate change wall to fall so easily…they surely will desesperate and turn violent. I mean that Edward Markey says that there are scientific answer on politics, so that politicians shall not debate politics but just obey when scientists says what is truth for science and for political action. So Edward Markeys view exclude political debate, but I therefor rather define it as fascism. So, how can we get our elected officials to understand that we need individuals with this perspective leading the discussions on AGW instead of the passionate ideologues who currently are in charge? Hulme recognizes a simple fact about human behavior which is, the more passionate, emotionally connected and outspoken one is to a position or cause, the more resistant and less rational and logical one will be in accepting any information that runs to the contrary. I would argue that one cannot be both a legitimate scientist and an advocate. A good scientist needs to be objective, analytical, detached, unbiased and impassive. Once you advocate for a cause, your ego, self-esteem, accumulated power and influence and career all are at risk if the positions that you advocate are shown to be false or even less true. The point is that AGW is a social science problem, and not a climate science problem, at all. A thoughtful article, indicative of the slowing “Ship of Climate.” Were it not for the alarmist attempts to obfuscate their political agenda with ever-more complicated science – the debate would not have devolved as it has. The alarmist approach, used successfully in the past, is to attack critics by appeal to authority, re-framing arguments, and ad hominem slur. The red flags should have flown high when the first critical voices of science were shouted down. Then came the river of cash in the form of liberal grants for those researchers who towed the agenda – aka “payoffs.” The SUNY Albany case is the first of many needed to correct the tainted results. Indeed. To be labeled a “relativist,” and commanded to limit uncertainties is confining in the classical sense. But the fact is uncertainties are far less today than when the debate began. Even while natural variability suggests a certain amount of chaos to be normal with climate. Hulme’s suggestion to include non-science disciplines is a good one. There is a place in the heart of artists that deeply respects truth, regardless of political propriety. And alarmists must confront their outed “psychology of shame” – wherein evolved practitioners accuse primitive humanity of fouling the nest. The accusation has merit when discussing real toxic pollutants. It has zero merit when applied to man-made CO2. And social scientists should question the reasons for social engineering. Is it based on sound community approval, or mob reaction to mass media scare tactics? Today, “business as usual” is the continuance of a fear-based campaign designed to limit market economies and tax the emission of a naturally occurring trace gas. The tax revenues are to finance social and political agendas by circumventing the democratic process. This is an attack not only on good scientific method founded on skepticism – it is an attack on the very nature of man. And those who oppose it deserve the honorific: humanitarian. A breath of fresh air from an AGW believer. The thing that so many of these frantic “true-believers” don’t grasp is that what they call “global warming” involves a lot of separate theses, only a few of which involve climate science. For example, “global warming would be a bad thing” isn’t so much climate science as agriculture and economics and marine biology and so on. “Global warming can best be stopped by restricting CO2 output” is a statement not about climate science at all, but about the economics and technology of the 21st century, which NO ONE knows much of anything about. Somewhere in the Guardian website – probably in Comment is Free – there is a piece by Mike Hulme from about two years ago, in which he calls for something he named “Post-normal Science”. As I recall, he felt that that pesky things like evidence should be o’er-leaped, so that politically correct conclusions could be drawn on global warming. If he has really repented of his folly, then good. Another True Believer leaves the fold (though not the belief). And now when he tries to speak in the language of true science, can expect to become yet another target for ad hominem attacks. He helped create the monster he now laments; he should not be surprised when it turns on him as well (as he is already apparently aware). 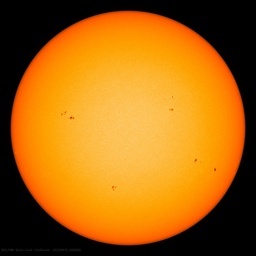 In fact some researchers think the next predicted solar activity peak, in 2012, could be one of the strongest ever, potentially kicking up storms that could bring modern technology to its knees. so, we dismiss out of hand the low levels of activity but hold out hope that the peak in 2012 will be one of the strongest ever, regardless of what the data suggest. i guess i shouldn’t be surprised…this kind of yellow journalism and science has become far too common these days! I would argue that one cannot be both a legitimate scientist and an advocate. I’ve made this argument about Hansen on many occasions. Once he became an advocate, he was no longer a legitimate scientist, no matter how long his laundry list of accomplishments. This was not intended to diminish past accomplishments in any way – since I’m not really familiar with his non-advocate work, just to point out that NOW, he is behaving like an ideologue, not a scientist and the head of NASA GISS. You are right, it is facism. To maintain power they must preserve the “consensus” by avoiding debate and ridiculing or discrediting the opposition. We all know that we should fear “police states.” But police are just a manifestation of authority. Scientists/Academics also have power of authority, which we must trust is supported by greater education and understanding. What is a NATIONAL Academy of Sciences? If, as Markey suggests, science should take precedence over democratic ideals, then we must submit to a scientific dictatorship. Is that better than any other dictatorship? [He stresses that he has little problem with the basic scientific understanding of climate change. It’s just that, if progress is to be made in debates on how to respond to that knowledge, they need to be opened up to other disciplines, from the arts and humanities, for example – and to good old-fashioned politics and ideologies. I cannot agree with this. The science behind AGW is flawed, and the proclamations of it’s effects are exaggerated, upside-down and backwards. Are we to assume that Chicken Little is correct and sit down to discuss the social ramifications of the sky falling down upon our heads? Nothing of any value could possibly result from that. There is no agreement on the fundamentals of the physics of climate change. We must stay focused upon that and not allow ourselves to be distracted by a tangential perspective of a non-existent problem. In any case, if the present solar activity is related to Ehrlich cycles or the theory in which the magnetic field of the sun twists and untwists, how can a solar cycle be so strong right after a period of which the sun been in a magnetic flux? It takes time to crank up the thermonuclear machine to get to that sort of magnetic coupling that can bee seen during high solar activity. Maybe this little drop back in 2005 is related to this magnetic field relaxation and until we see a sudden rise in the graph, the sun will stay in a low magnetic coupling phase. “Somewhere in the Guardian website – probably in Comment is Free – there is a piece by Mike Hulme from about two years ago, in which he calls for something he named “Post-normal Science”. As I recall, he felt that that pesky things like evidence should be o’er-leaped, so that politically correct conclusions could be drawn on global warming. I hope he really has repented; however on reading the article, I had the strong feeling that the ground was being prepared for “the science” to be ignored when the full scientific reality – as is so well demonstrated on this excellent wuwt blog – eventually causes the wheels to come off the AGW story, and the “politically correct conclusions” can then be drawn as before. One of the climate related theories that possibly will be confronted with reality is that one of Dr. Henril Svensmark. Plain logics indicate that It works ! but, i’m afraid, just in the lab. Why?, simply because for those kind of Cosmic Rays of Doom to work they need humidity, and having cooler seas we have in turn less evaporation and, consequently, less clouds. Bad luck if those rays are at its peak precisely when seas cool. That’s bad luck I would say. Abstract. A theory is described based on resonant thermal diffusion waves in the sun that appears to explain many details of the paleotemperature record for the last 5.3 million years. These include the observed periodicities, the relative strengths of each observed cycle, and the sudden emergence in time for the 100 thousand year cycle. Other prior work suggesting a link between terrestrial paleoclimate and solar luminosity variations has not provided any specific mechanism. The particular mechanism described here has been demonstrated empirically, although not previously invoked in the solar context. The theory also lacks some of the problems associated with Milankovitch cycles. Speaking as a lowly biologist, I would have to say that Hulme’s perspective is exactly correct. Climate change debate has to include the social sciences/humanities because science is indifferent to humans. Scientifically, climate change is never good or bad, it just is. Climate change was bad for dinosaurs, good for mammals; bad for mammoths, good for humans; bad for polar bears(? ), good for a number of other species. Our social ideologies will decide what we do about climate change. I wonder how history will define the two factions. Maybe environmentalists vs. humanists? Pearland Aggie (10:02:44) : “We live in interesting times indeed”, what we can already see is how is it going earth’s energy budget, how much our seas saved that “warm money” and how much of it it have spent up to now. What we are to see, also, is if in a minimum there is an increase of volcanic activity and if, as a consequence of emitted areosols temperature lowers. I don’t know if there are enough sources of information to get all the data needed, however we’ll know it through WUWT for sure. It’s not hard to get labelled a climate change “denier”. You don’t even have to deny that climate change is real, man-made and a problem. As Bjørn Lomborg, climatologist Patrick Michaels and political scientist Professor Roger Pielke Jr have discovered, you merely have to challenge the orthodox political policy responses. Or, like Climate Audit’s Steve McIntyre, dare to scrutinise the statistical workings behind influential climate research papers. If you stray from agreeing with the political prescription, you’re an immoral person. How can Gore make $$$ if the social sciences decide that global warming is good for humanity and most of the planet? They would never allow them to give their opinions. But regardless of what we human decide of what is good or not regarding the climate… nature will just follow it’s course and there is nothing we can really do about it else than get better technologies to control our immediate environment and certainly not the global environment. Peope have no idea how big the earth is and it would be foulish to try to control the climate on a global scale. but did anyone else catch Chris Matthews asserting that if you believe in God you cannot be trusted on science issues? He also suggests that if you do not believe in Climate Change you cannot have an credible energy policy because rejection of climate change is to reject science. I find it disturbing because this is the problem with the politics involved in science and how science is taken hostage of ideology. People, he’s not talking about the scientific consensus among climate scientists. He’s talking about *political* consensus. That reminds me of when I was young and reading comics. You always had this doomsday sayer guy with long beard, a sandwich board and a gong that would yell to the world that “The End is Coming, repent”. Of course nobody listened to those idiots. How times have changed. We have the same people (cleaned up though) but now lost of people beleive them. On the strength of these unusual words of recommendation, posted at Amazon, I’ve ordered Mike Hulme’s book. Being aware of the reality of the spiritual/inner dimension generally, in my experience, makes it more natural to observe one’s inner reactions, and thus have a chance to mature in one’s attitudes. Maybe Misanthropic Ecophiles vs. Eco/Anthrophiles? So it doesn’t surprise me that these folks seem to have a skeptical bent. Shows a NASA study implicating smog reduction in increased arctic ice melt of the past several years, not CO2. It’s the GREENS that melted the Arctic! Youz wuz tinken meby dey wuz honust? Of interest is the fact the Hulme is the Professor of Climate Change at the University of East Anglia, which, along with the Met Office and the BBC, is part of the “Temple of AGW” in the UK. With him at the helm, maybe there’s hope yet. Pamela Gray (07:47:03) : If any of this nonsense about CO2 makes it into legislation in the form of taxes or cap and trade here in the US, I for one will volunteer my time to sit in jail for my refusal to pay any additional costs to what I buy as a result of this voodoo snake oil science. In other words, a tea party sounds like a good idea in the near future. That, BTW, is how these things generally sort themselves out. Joe and Jane Sixpack just making their own individual choices; and the “leaders” be darned. One person, one decision, one failed policy having inverse consequences at a time. Like the California increase of tax rates that resulted in an $8 Billion reduction in revenues. I don’t expect them to figure it out, I expect the state to fail catastrophically, then it can reboot. At 11% income tax and 10% sales tax I now actively avoid any income I don’t absolutely need (keeping it in tax sheltered accounts) and actively avoid any expenditure I can avoid. Good for the soul and the wallet. So a tea party sound fine to me, and I’ll participate. But I’ll also substitute home made bread in my bread maker at 30 CENTS a loaf for the $3 stuff headed to $5 loaded with CO2 taxes, fuel costs, and high priced labor. I’ve been looking for a thea chinensis (they grow well anywhere that their first cousin Camellia grow and California is great for them). Maybe I’ll try a little harder. It would be nice to have a tea party with non-taxed tea 😉 You can process it in your oven on warm. To be Chris Matthews is to reject rational thoguht processes. but did anyone else catch Chris Matthews asserting that if you believe in God you cannot be trusted on science issues? He, like any other “believer in the consensus,” prefers the ad-hominem over rational argument any day. What happens when an atheist (or agnostic, or Buddhist, etc.) says he doesn’t believe in climate change? Does that make him right? It provides easy to use bullet items if anyone wants to send a comment to the EPA on the EPA’s proposal to find that CO2 is a “pollutant”. Limiting CO2 will deliver peace on Earth?? And AGW is science and not politics?? But then it’s not mid May yet, is it? Peter, if history is any teacher at all, discourse and verbal persuasion gained precious few battle victories and won even fewer wars. And if wars ended because of discourse and verbal persuasion, peace has always been a fragile demilitarized zone. When push comes to shove, I shove back. The sensible thing to do will be to weather it objectively. Appearances suggest that a lot of the folks who appear to be supporting AGW do not actually believe in it. When I see comments like this, it reinforces my view that the whole debate is (painfully slowly, perhaps) approaching a neutralized state. If one takes a multi-dimensional view, it almost can’t end up anywhere but neutralized — there’s just too much discord – and some of it is fierce. a) undermine the public’s trust in science? b) lead to a war? After quickly coming up with “yes” & “yes”, it seemed sensible to expect to see the debate neutralize itself (since sensible people will be on the case, raising the game) and eventually become differentiated from the issue of pollution. This I have no problem being explicit about. Trends in attitudes towards & use of the word “consensus”. Have I missed something? Everyone appears to be swooning over this guy’s “reasonablness” but I understand him to be stating that the global warming argument is not about science; he is taking a position of unreason. An English blog I council philosophers to read is “Climate Resistance” which covers many of the political, philosophical and sociological aspects of the global warming scam in the UK. Sorry, I’m watching the video. This guy is responsible for running one of the most hysteric organisations and now dissembles. Note he uses the term “climate change” when we all know he, and his ilk, are postulating catastrophic global warming. We must hold these slime-bags’ feet to the fire of their rhetoric; not let them escape to the air conditionibng phrase of “climate change”. When they say “climate change” they mean “Man Made Global Warming Through Burning Fossil Fuels”, which is a crap theory; absolutely no supporting evidence. So, NO!!! I do not pass this man accolades; I denounce a rank, hypocritical, self-interested, snake-oil salesman. First. Thanks for your reply! My main point is that it is through discussion we can keep a civilized (and democratic) society. Discussion is also important in science (although in particular natural science (but I hope also other areas) must be conducted within a framework where the categories true and false exists and are a crucial quality which enables science). Anyway their authority isn’t relevant for politics! My main point, which is also Hulme’s main point, is that science has no political responsibility. Science shall not govern society. Scientist can have – and it’s good if the have – opinons in political matters and contribute in the common debate, but it’s not up to them to decide political path. NAS is good (if your intention was tio discredit their competence), but NAS has not said what politicians should do! That’s a misinterpretation by Edward Markey, or more likely rhetorical tactics from him! Edward Markey takes “science” as an alibi for radical politics. Politics where politicians (as himself?) takes control. He may be concerned about climate too? I can’t say! One thing about Edward Markey is that he seems to be stupid. He said a year ago that Black Hawk Down in Somalia was the result of human global warming, and so was the Darfur conflict. Also Hurricane Katrina – of course! The reason why political decisions by science is wrong I think Mike Hulme explains. Politics has to be discussed. Also scientific results — which are not at all aimed to define political solutions — has to be discussed (the whole practical scientific process, peer reviews etc). Discussion is a method to find the best rational solutions in politics — so let politicians do that!!! — and in science communication and discussion is a way to shape a more true description of the world we live in, basically in terms of cause and effect, or? Scientist are not good politicians, but the thing with Edward Markey isn’t that he say they are. He says to us that scientists tells us we shall introduce Cap and Trade (ironically Hansen, the biggest alarmist and political scientist on Earth, don’t say that). But that’s a trick from Edward Markey, who is a “good politician” in the respect that he is good at rhetorics and to cheat the public. So is Al Gore. These politicians says scientists has pointed out an answer which equals their own suggestions of big government politics (which at least Gore will benifit hugely from…). NAS is only used by these politicians for their own purposes. NAS has to continue to say AGW is serious in their organisation’s political statements, otherwise they don’t think they will get money next year. The latter is a little detail. The big thing is if politicians uses the credentials of “science” (all scientific work on Earth), and with the false picture that science do not dispute things and says what politicians shall do argue that political debate mustn’t take place. Edwards words “it was not a science based decision. It was strictly political” is really horrifying! Or the implication of those words I mean is horrifying. The implications are that politics (discussion) cease to exist and are overthrown by The One Way that politicians say that science say that politicians shall do. Let me clearify my positions too. I like the police, and I don’t think youtr word “police are just a manifestation of authority” has anything to do with this. A second thing I should say about my position is that the discussion I prefer don’t mean that I like compromises and “in between”-solutions in everything. I think dialectics is kind of a problem. I want discussion because I want a civilized society, but I defend zero taxes and zero burdens on carbon dioxide, although I don’t think we’ll get there. I can however accept small taxes like those Lomborg suggests (but on national, not international, level). It wont hurt economy that bad and reduce energy consumption sligthly. But I can’t defend taxes on carbon dioxide. That’s my position. You mention the national Academy of Sciences (NAS). And, unstated, is that the NAS members will provide thew politicans with ther excuses, and will be very well paid in research dollars. If the US goes over the cliff with Cap & Trade (Tax & Spill) it is because too many voices yelled “Fire” on a crowded planet, thereby letting the horses out of the barn and opening a Pandoarra’s Box of Massive Climate Alteration Nightmare Experiments. Wiser heads are starting to prevail. Mike Hulme appears to be sliding towards a side exit. Remember that the University of East Anglia has for decades been THE centre of global warming hysteria in the UK. Re the US National Academy of Science (NAS). The North Committee reached strong conclusions that condemned Mann’s hockey stick, but the Committee Chairman, Dr. North, aggressively obscured those conclusions in his public statements. Dr. North displayed an appalling lack of objectivity, imo. The Wegman Committee reached similar very negative conclusions about Mann-made global warming, and were far more forthright in their comments. While I am by no means a scientist, I like to follow the science and I relish the chance to debate the issues surrounding AGW. To argue the position, or at least infer that CO2 is the primary cause of climate change is like taking a page right out of the “KISS” rule book. The issue of increased concentrations of CO2 in the atmosphere should not be the basis for a bureaucratic hijacking of our Energy, Economic and Tax policy. With current levels of CO2 concentrations in the atmosphere being measured at 385 ppm, an increase of 100 ppm since the end of the “Little Ice Age” and a host of other variables and complex interactions that contribute to our climate, it is just too simplistic to hang the “Here’s your villain” tag around CO2. But guess what?… There are a lot of people who have bought It! Such is the power of a simple message, the advocacy of a number of lobby groups and political constituencies and a well known face all working to push forward the agenda. However, I feel confident that the science will eventually rule the day. Once water vapor and methane are given the proper focus as GHG contributers and the importance of CO2 to both plants on land and algae/plankton in our oceans is understood, then the fallacy will be exposed. Carbon Dioxide is not the problem… it is just being used as a convenient scapegoat. I just finished watching a National Geographic piece on the Liscombe Fossil Bone Bed. The bone bed was first discovered in 1961 on the Colville River on the north slopes of the Denali National Park in Alaska. The find dates back to the Late Cretaceous Period (50 million years ago) and contains the bones of numerous Troodons and further downriver, fossil remains of Hadrasaurs. The point being… how do cold-blooded reptiles exist in an Arctic environment? The answer has nothing to do with hibernation of species that have no prior record of exhibiting such behavior. Study of the bones show no growth ring patterns that would indicate dormant periods similar to those of trees. The only conclusion made was that the species in question were indigenous to the region and well adapted to it’s temperate climate. That’s Right! “Temperate”. Which points to a planet and a polar region much warmer than it is today and as a consequence, a planet that had a much higher CO2 concentration than current measurements. The record from the Jurassic seems to support a more temperate planet with vast subtropical regions where CO2 concentrations measured as high as 6500 ppm. Oh Yeah!… and Guess What?… the planet somehow managed to survive! But remember!… the sky is falling and CO2 is the cause! I think some data is being passed around outside of public scrutiny that has turned some heads. My guess is that it is from one of the hard sciences such as physics or astronomy. But who is to say? The climatologists may be sitting on a land mine. Look away children and remember their example. are we studying social conformity or climate? The way I read it, Hulme is arguing from a “meta” perspective rather than about any specific matters of climate science. He is saying that the issue of climate change encompasses much more than the bare science – it also involves values, the sort of society we want to live in, and even our vision for the future of humanity. In other words, climate change has become a proxy issue, in which many other battles besides the actual science are also being fought. Most of the committed people on either side of the issue will have little difficulty in recognising the worldview of their opponents. However, they are often too busy shouting at each other to notice that both sides want essentially the same ends, but view the achievement of those ends from very different perspectives. What to do? I’ve no idea, but a good start would be to find ways of framing the issue that recognise the similarities between both sides and enable them to seek common ground. Ok, Brendan H, are you being rational today in order to win me over, cuz it’s working you big lug! No, you don’t got my point …because I wasn’t clear enough. I agree with Allan M R MacRae (20:08:52) that NAS’ position isn’t aggressive AGW, and that they therefor don’t say what Edward Markey assume (or lie about) that they say. I should have said that politicians use the word “science”, not actual science. I’m on the NAS side in that they do not propose any political program such as the Waxman-Markey bill. NAS has had a development which Lindzen describes in the document “Climate Science: Is It Currently Designed To Answer Questions?“ (*). Lindzen describes a new Temporary Nominating Group for NAS (which I think was suggested by the environmentalists) where not so bright scientists, like John Holdren, has got their way into NAS. Many of those elected via the Temporary Nominating Group (where scientific merits isn’t prioritized), like e.g. Holdren, has reached top positions within NAS. That’s a shame. But still NAS just say that AGW is real (as other scientific bodies in the world does), and they didn’t told the congress what to do with the Lieberman-Warner bill, as well as they don’t tell them what to do with the Waxman-Markey bill, or any other political decision! Markey is therefore lying about NAS position (using the good reputation of that organization). Let me also mention tactics which I can see is now used on a political level dressed in “science“; not mainstream sound science, but a political climate alarmist movement based on Universities. Thus only the word “science” as a symbol — for politicians — for settled knowledge. The tactics I see is the preparation for the Copenhagen Climate Conference in December. The group which was responsible for the first Copenhagen conference in March this year was IARU (Hulme was invited as a moderator at that conference, and mentioned this in a partly critical BBC article (**)). A self appointed group from the self appointed 11 best Universities in the World. However, a problem with the March conference In Copenhagen is that those who participated almost everyone are climate alarmists. We had John Schellnhuber from Potsdam Institute for Climate Impacts, which is a very alarmistic Institute which “science” is to make models with positive feedbacks and tipping points only. I don’t think they are doing anything else. Schellnhuber is a theoretical physicist with math skills, but he isn’t a climate scientist. Another mathematician and climate activist is Amanda Lynch at Monash University. She’s also study the limits of a climate out of control, sort of. So here we have a bunch of climate alarmists who are telling the politicians what they shall to in Copenhagen in December. No dissidents are tolerated, and I’m sure even Mike Hulme, Hans von Storch and other climate scientists believing in AGW are rejected as dissidents, although Mike Hulme was invited as a moderator (maybe to “act as a poster boy” for a less alarmistic position). The Copenhagen meeting is prepared as a meeting for a narrative, which is the narrative of UN too, and which asks for more government, and even world government on carbon emissions. Politicians will be likely to praise “the science” as a political road map which they follows as servants — for the good sake of the people. But the winner is the environmental movement, which I would say is a leftist movement, and the same movement as the one 1968 and at the first Earth Day 1970. This is a political coup (buy activists, science in general not to blame; although political scientific bodies shall be embarrassed). Let’s hope lots of countries are strident against the international carbon trade scheme which UN wants to have. I also think that politicians in all countries in the West should grip what I have mentioned here. A complementary note: I would like the preparation group for the Copenhagen conference being targeted by the media as a interrest group. A new major theme should be prepared by the media, about the political coup by environmentalists! That would be a selling story today, New York Times! What are you waiting for? I’ve visited this site and read the articles and comments for quite some time now. I’ve followed innumerable links to other articles, giving views on both sides of the debate. Since those making comments here are often true scientists, which I am not, I’ve not ever posted a comment. But Mr. Hulme’s views bring up something that has been bothering me for some time. A lack of clear and honest discussion of the issue. My view of science was that one may have a theory within your field of study. Observations are made and/or experiments designed and run to either prove or disprove the theory. This should be repeatable. Underlying this, I’ll admit’ rather simplistic understanding of how science is conducted is the idea that facts are immutable. They do not change and are readily apparent to another expert in a given field of study. If I understand correctly, this site originally came into being to point out problems with land based temperature measurements being taken across the US. A potential source of bad data. So why do I hear people across the globe putting forward as fact statements that are diametrically opposed? Why do I hear that global temperatures have been dropping since 1998? No their not, 2005 was the warmest year. That Arctic ice is shrinking. No it isn’t, it has started to recover. The Greenland ice sheet is melting. Not it’s not. Antarctic ice calving is a sure sign of coming catastrophe. No it’s not, it’s normal and ice coverage in the Antarctic is growing. CO2 is a pollutant. No it’s not, it’s vital for life. Global temperature rise and increased CO2 are good. OMG NO! We’ll reach a “tipping point” that will plunge the earth into fiery hell! And on, and on, and on, and….. I think you see my problem, and one I think Mr. Hulme is suggesting that we solve. If scientists can’t even agree on what baseline data set to use, what hope is there of ever arriving at the truth? I realize that scientific discovery can be adversarial and competitive, but we should at least be able to agree on the reliability of simple observational data? It gets me so confused my head hurts. “Uncertainty is a constant companion of scientists and decision-makers involved in global climate change research and management. This uncertainty arises from two quite different sources – ‘incomplete’ knowledge and ‘unknowable’ knowledge. ‘Incomplete’ knowledge affects much of our model design, whether they be climate models (e.g. poorly understood cloud physics) or impact models. The following year he founded the Tyndall Centre and uncertainty became a thing of the past. Part of the Tyndall mission statement was to “exert a seminal influence on the design and achievability of the long-term strategic objectives of UK and international climate policy”. It sought to integrate scientific and social disciplines in promoting the idea of dangerous climate change and to stimulate public policy initiatives on energy and transport. It aimed to motivate society into an acceptance of the catastrophic perception of climate change and to impart the view that it, (society), has the ability, but needs the willingness to “choose our future climate”. Great relief, the UK was back on message. 1,200 participants have just attended the Open Meeting of the International Human Dimensions Programme on Global Environmental Change (IHDP), a research arm of the UN. I thought it already was….. This is getting to the meat of the climate issue. Well-worth thinking about so we can avoid a cold & calculated disaster based on the untenable assumptions that underpin so many of the “facts”. Free people are not going to volunteer to be slaves of false “reason”. It could take decades, centuries, or even millennia to have (all of the necessary) reasonable (no””quotes) facts. If we risk entering an era of cold calculation – where calculations govern decisions – it will be wise to truculently expose the pervasive abuse of ‘mathematical convenience’, with an aim of eliminating our reliance on untenable assumptions. Thank you for bringing some much-needed ideas to raise the discussion out of a lazy belief that binary black &/or white algorithms supply “good enough” approximations of naturally-twisted-grey. It’s no longer “us & them; with/without”. At this stage of radiative diversification, one might say there are a multitude of camps ….although even that is a semantic simplification. Momentum of this magnitude isn’t available every day and can’t necessarily be conveniently & quickly stirred up artificially via costly-orchestration. Much of the science relevant to the climate discussion involves detective work & conjecture without the possibility of experiment. The scientific debate is (slowly) neutralizing itself. Eventually there will be a changing-of-the-scientific-guard and then there can be a new era of scientists – & citizens – who can be fully trained in nonlinear & conditional thinking. Today’s climate science has stalemated itself through inability &/or unwillingness to be large enough to contain apparent contradiction. Hence the maturing & necessary drift in productive discussion-focus towards the kinds of points Magnus A (17:12:25) raises. Just working on my vision for the future of humanity. If you mean there are a range of views about climate change among climate scientists, that’s probably always been the case. The IPCC reports present a number of scenarios including, for example, a range of possible temperature levels from CO2 forcing. And of course sceptics also occupy a number of positions vis-a-vis climate. That said, there is a definite dividing line between those who reject climate change or its extent, and counsel inaction, and those who accept climate change and the need to take action. On the political/economic/social side there is likely to be an even greater diversity of views, since as Hulme says, one’s position on climate change does not determine how one might respond to it. Even so, if most climate scientists are left-leaning – and I have no idea whether they are — they would most likely opt for solutions that are government-led, or at least have no great objection to them. The positions don’t lie on a linear continuum – and whatever dividing lines may exist are confused & obfuscated by natural desire to curb toxic pollution (CO2 aside) and earn money. What we are seeing is a lot of people who are willing to “go along” with a ride to get to somewhere else …and that “somewhere else” could be an opportunity to profit from a ‘green’ economic framework &/or, more simply, a perceived opportunity to reduce toxic pollution – for 2 examples (with beliefs about CO2 left aside). A lot of poker-faces and few showing their true hand. Step A – Get a control system in place. Step B – Adjust it to be something else (perhaps something sensible) later. …but it is making a lot of folks look crooked since “sensible” is left out of Step A and not guaranteed later. If they would switch the slogan from “ghg” to “toxic pollution”, they would appear a lot more honest & credible. 1) Hardly anyone in the game appears honest, so whichever way things go is unlikely to have much to do with truth. 2) Anyone projecting that scientists can’t &/or don’t lie appears profoundly (almost incomprehensively) naive. You’ll always get people jumping onto a bandwagon and bringing various motivations to any enterprise. That’s just human nature. And people also have mixed motives. Someone may desire to ‘do something good’ for humanity and make a very good living as a surgeon. The energy executive may spot a profitable opportunity in renewables and enjoy a feeling of virtue at reducing his carbon footprint. What’s happening at the moment, especially in your country, is that the politics is moving the issue to the point where action is becoming a reality rather than a distant possibility, as previously. As a result, the motivations of the various parties are becoming more visible. I don’t see anything untoward in this. It’s true that scientists can lie/deceive themselves, but the default position, as with anyone, is surely that scientists should be presumed honest until shown otherwise. Do you have an insider’s view? The research/higher-education system is not working well enough for civilization’s needs. 2) lack of secure funding. 4) unfathomably nasty administrative culture. A few years ago I was estimating it would take 3 decades to make substantial improvements to the system. During the past year I have revised the estimate to: Indeterminate.